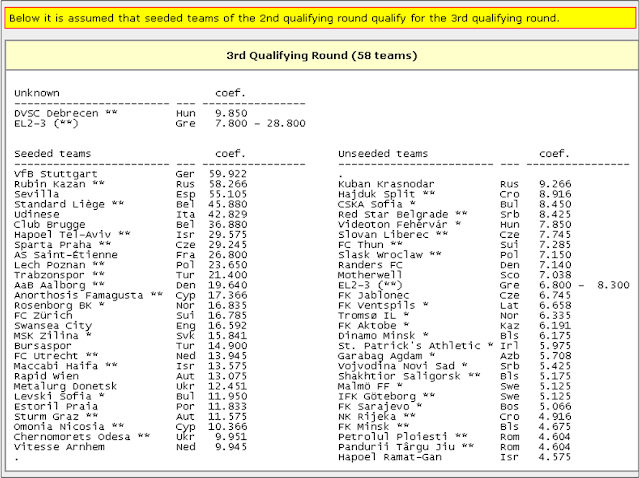 The qualification process for the Group Stages of the Europa League is a long and pretty complicated one, but thanks to the Europa League section on Wikipedia and a great article on seedings by Bert Kassies, I've put together what it's likely to mean for the Swans. It'll no doubt annoy those moaners who say a Welsh club shouldn't be in an English league, but thanks to the fact that Swansea are technically a representative from England this means that Swansea benefit from the English sides high country coefficient (rankings based on past performances from teams from that association which when added to that teams own coefficient for recent activity in Europe gives the overall ranking. 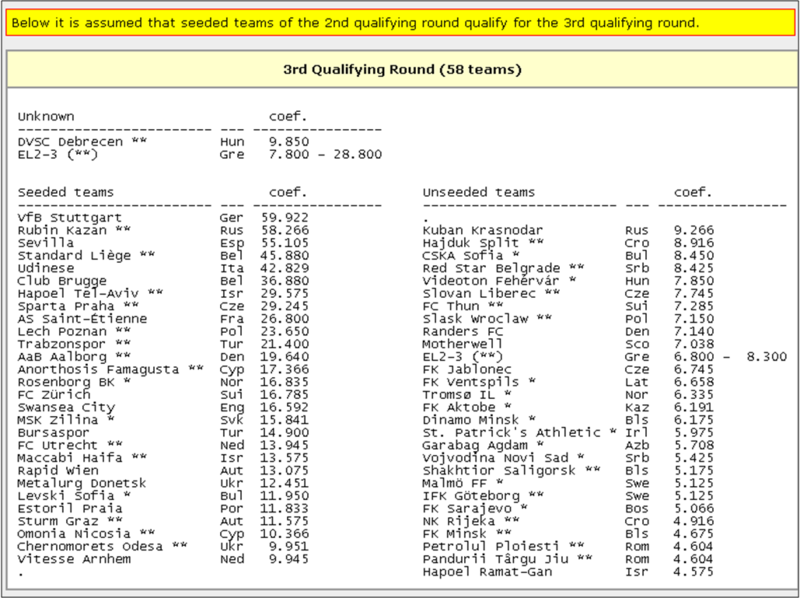 This means that Swansea will be seeded for their Third Round qualifying game on 1st/8th August. 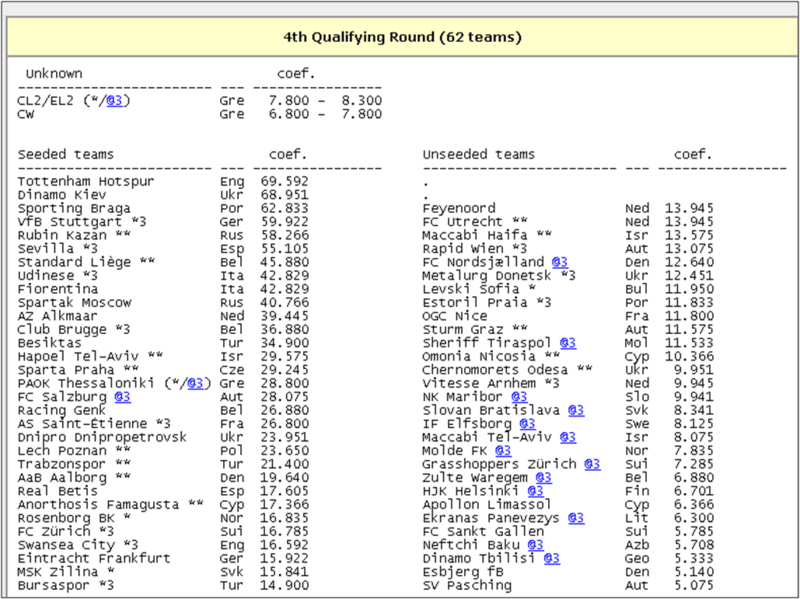 Who they will face will in part rely on who gets through previous qualifying rounds but there are a few big names that we definitely won't face in this round such as Stuttgart, Sevilla, Udinese (also can't play Spurs/Wigan before last 16 as from same association). There a still a couple of places to be finalised but there a few big names (in historical terms at very least) in the list of possible opponents such as Red Star Belgrade, CSKA Sofia and Malmo with somewhere in Eastern Europe looking a good bet for Swansea's likely destination. 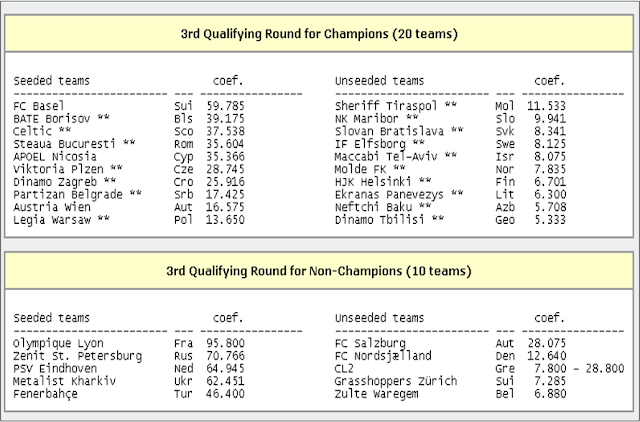 Likely Seeded/Unseeded teams based on assumption highest ranked teams qualify through previous rounds. Anyone fancy a trip to Motherwell? If there weren't enough unknowns in the 3rd qualifying round draw, the Playoff round is even more convoluted as it also involves teams that lose in the 3rd qualfying round in the Champions League. Based on results going according to rankings, Bert's site has Swansea also being seeded for this round. The thing to bear in mind with the seedings however is that had Bradford won the League Cup they would have the same rankings points as Swansea do, so there's bound to be some relatively well ranked teams who will lose to lower ranked opponents. 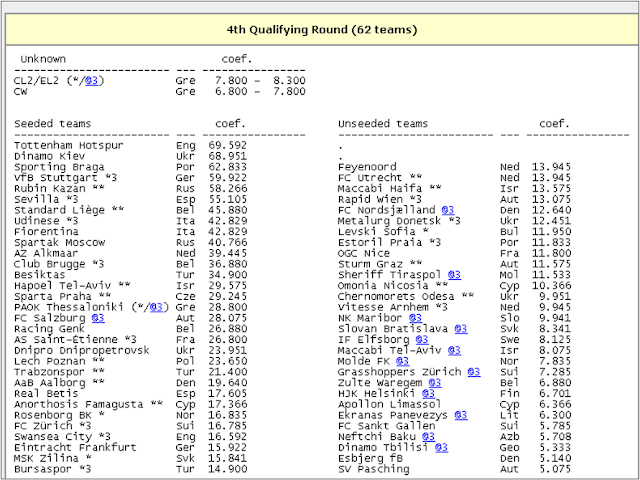 For this round Swansea are pretty close from moving from the Seeded to the Unseeded half of the draw. Worst case scenario is none of the teams ranked above us who play in previous Europa League qualifying lose and then 4 or more teams ranked higher than Swansea from the 3rd Champions League qualifying lose. There will be 12 games of the 15 where which will feature a team ranked both above and below Swansea. 2 will feature both teams ranked below and one game with both teams ranked above Swansea (this has already been factored in by Burt as FC Salzburg are the predicted team to end up in the Europa League). This means at least 4 of the remaining twelve games have to go the way of the seeded team losing to push Swansea out of the seeds for the Play Off Round (along with all Europa League games going the way of the seeded team). Personally I'd expect a couple of the bigger teams to lose their Champions League qualifying round but this to be offset by some of the higher ranked teams in the Europa League also losing so I'm pretty confident that Swansea would be seeded in the Play Off round (assuming they get that far). There's still loads of if's and maybe's around what's going to happen but will be worth keeping on eye on the Europa and Champions League qualifying to see who we could end up getting. It could range from a couple of minnows to being Hibs then Motherwell or Red Star Belgrade then Lyon.